A troop of the Suffolk Yeomanry. 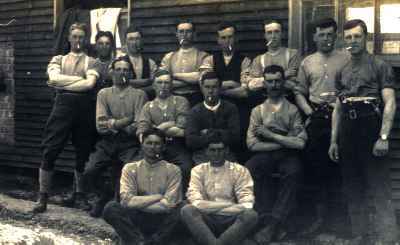 George Norman is seated front row,4th from right. Robinson Mitham is seated on extreme left. The knowledge that the Rev Selwyn Sharp was serving as a chaplain in France would have been of some comfort to a lot of anxious parents in Swavesey although Mr & Mrs Norman were part of the Bethel Baptist congregation. The four friends (all unmarried) joined up together on Monday 11th April,1916 and initially trained within the same troop. By the time they had completed four months of initial training, the Somme battle had been dragging on for over a month and the need to replace those who had already lost their lives was paramount. The requirement to field cavalry troops had all but disappeared and young George at the age of 20 was drafted into the 7th Royal West Kent (RWK) Regiment. 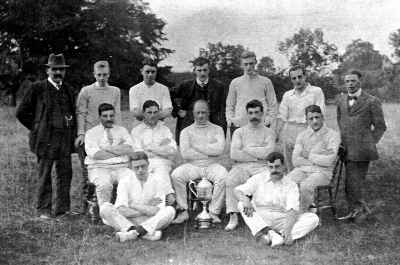 The Swavesey cricket team including the Rev. Sharpe (standing left). The 7th RWK Regiment formed part of 55th Brigade ,18th Division under Major General F.I. Maxse (a particularly astute and competent GOC). By a happy accident of fate, the Reverend Selwyn Sharp was attached to the 7th Buffs of the same Brigade. Rev Sharp had sailed for France on January 25th 1916 for a 12 month stint overseas. His erstwhile parishioners in Swavesey heard of his pastoral mission via the Cambridge Independent Press. The Vicar at the Front - .....serving as chaplain to the Forces in France until January,is now working at a large hospital almost all under canvas,but expects to go up the line very soon. On Easter day he and another chaplain held about 30 services,the first at 5 a.m.and the last at 8:30 p.m.
News of the Vicar - ....has now been moved up the line....in a letter dated August 1st he says " ....am now somewhere in France,not a great distance from the firing line. I had, as you know expected to get up some time ago,but one had to wait one’s turn. We have had a good deal of marching and this hot weather and the dust have made things not always pleasant. However, I have had no cause to grumble so far. We had some services under strange conditions on Sunday last. I managed to hold five in all - open air of course. I would have given anything to have Gilby there to start the hymns. The tail board of a farm cart served as an alter for one of the celebrations,and I utilized a fallen tree for another. For the present at any rate I am attached to a battalion of the Buffs." George Norman joined his regiment in France during the second week of September 1916. He was to die three weeks later fighting hand to hand in the Schwaben redoubt, near Thiepval, just 15 days prior to his 21st birthday. The Schwaben was a German front line strongpoint which had been successfully stormed at zero hour on July 1st by the 36th (Ulster Division). Unlike the Divisions on their flanks the Ulstermen were able to advance about one mile in the opening assault. Shortly before the whistle blew, a Belfast boy called Billy McFadzean had thrown himself over a live grenade thus giving his life for a group of comrades (young Billy Mcfadzean was posthumously awarded the VC and has since been immortalised in song). This had fired the Irish lads up and any waverers were further encouraged by the sight of many of their compatriots donning their orange sashes and Major General George Gaffikin roaring the traditional Boyne war cry of "No Surrender !". Regrettably,despite 6,000 Ulstermen having been killed, they were forced out of the redoubt by a series of ferocious German counter attacks. "At 6:30 am on the 29th September the 7th Royal West Kent Regt began to take over the whole line from the Western face of the Schwaben redoubt to the German front system. There was fierce fighting during the relief,and by 7:30 am a hostile bombing attack had recaptured a trench junction North West of the redoubt. On the Western face of the redoubt the combat continued all day,with heavy losses on both sides. German bombing attacks,each preceded by a bombardment....on the subsequent day the Regt was forced down the Western face in close bayonet fighting." At the tail end of this fight, George had been severely wounded and he died in a field ambulance on his way to a casualty clearing station a few miles behind the front line. 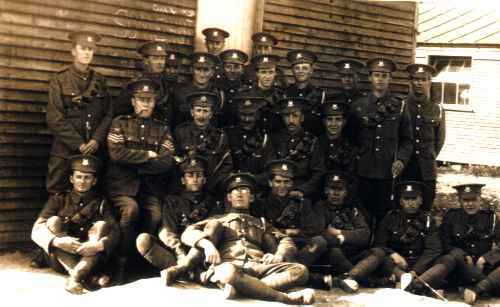 The Suffolk Yeomanry in civvies. Seated in front are George Norman (right) and Bob Mitham. The Reverend Selwyn Sharp officiated at the burial service in France and subsequently wrote to Robert & Sarah Norman in Swavesey to advise them of their son's death. "....His body was covered with a Union Jack and laid to rest in the British soldiers cemetery some way behind the line. I conducted the funeral service. He died the death of a gallant soldier....he died for his country-you can think of no nobler epitaph than that....his grave will be well cared for." The vicar remained in France until January 29th 1917 (although he did have a further 12 months service starting May 5th 1918.) His letters back to the parish became more and more poignant. "I seem to have been on horseback ever since I got back here - it is the only means of progress as the mud is unspeakable: up by the guns it is simply terrific - and not infrequently a man has to be pulled out - it is feet deep. The rain and wind are incessant. One gets wet through and tired out every day,and yet somehow one does not catch cold.....I had five services yesterday and rode about 14 miles,besides tramping a mile or two....Two of the services were held in old dugouts by the guns and one especially was most encouraging. It was held in an old German dugout. I celebrated the Holy Communion and we had three hymns. The dugout was quite full,and men were standing half way up the steps: it was a strangely impressive service." The spot where George originally fell is close to the present day Ulster Tower and his body lies in the Commonwealth War Graves Cemetery at Varennes (South of the Doullens/Albert Road 11km from Albert) where it is indeed well cared for. 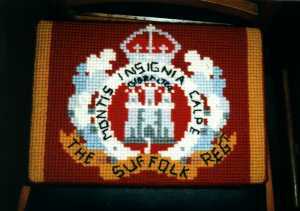 Yeomanry badge and kneeler from the Suffolk Regimental Chapel in Bury St. Edmunds.